Planning a getaway with the squad? You might want to try Digha for that relaxing weekend with a bunch of good friends. It’s light on the pocket and has great seafood options. Here’s our guide to spending a weekend in the beachside town. When we say quaint, serene beaches it’s mostly Old Digha. New Digha usually attracts more people, so if you like people-watching, and want more options for hotels, eateries, souvenir stalls and the likes, you will like New Digha more. 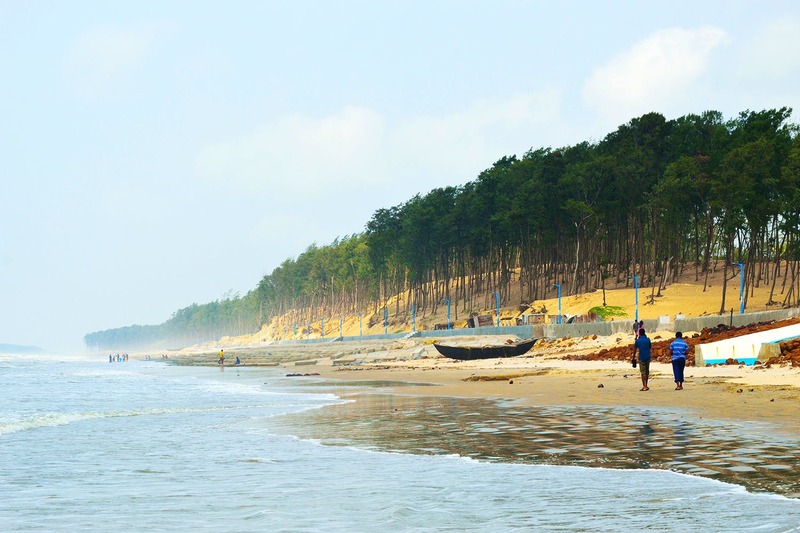 In fact, New Digha also provides facilities for para-sailing, water-skiing, and snorkeling. A short distance away is Udaipur Beach, which not many people know of. So if you want a quiet place for soul searching, maybe this could be it? Or, 14 kilometres from Digha, think Shankarpur Beach, where you can witness local fishermen at work and visit temples. And if you are a foodie, keep Talsari Beach on your list, because legend has it that it has the best seafood in and around Digha. Digha has a lot of places to explore around it if you’re up to some driving or traveling around. There is the Marine Station of the Zoological Survey of India, which is interestingly one of the most well-equipped marine aquariums in India. There you will find a host of specimens, especially the local fishes of the Bay of Bengal. There is also a temple around 8 kilometres from Digha called Chandaneshwar Temple, dedicated to Lord Shiva. You might find it super crowded around New Year’s though (that’s the time for the annual pilgrimage), but it’s a good visit otherwise. At Amarabati Park you can go for boat rides and ropeway rides for just a nominal fee of 5 bucks. Check out local vendors, especially for seafood. When you walk along the beaches, you will find local fishermen selling some of their fresh produce as fried nibbles. You can also buy fresh fish like ilish, pomfret, parshe and prawns from Mohona Digha fish market in the morning and have them cooked at the numerous “Dada-Boudi’r” joints around Hotel Sea Hawk. You might not get super luxurious options to choose from, but you will get some really nice places to stay right by the beach. One of the most popular options is Sea Hawk hotel mainly because they offer fancy beachside cottages which are just across the sea. Hotel Coral Digha, just a few minutes away from New Digha beach, has a poolside and is also pet-friendly! Another good option is Hotel Le Roi Digha, a 7-minute walk from New Digha beach with free WiFi and parking.